Without doubt a bicycle is the cheapest/ most efficient/ and healthiest form of transport there is, so if you are thinking of buying one for the first time here a few pointers to bear in mind. First, which kind of bike? Apart from the off-beat there are basically two choices: new/ second-hand and road / mountain. In my experience second hand, unless you get it from a reputable bike project (ie comes with a warranty) is always going to turn into a disaster. They always need new parts and often it works out cheaper in the long run to have bought an entire new bike instead, or the hassle alone will make it seem like that. A decent new bike, one that will last, is going to cost at least £500+. Though if you have the patience to wait until the buying season is over you could snap up an end-of-line model with a massive discount. Road bikes are lightweight (easy to carry) and fast on the level, but only thrive on the best of tarmac surfaces. Mountain bikes are heavy and slower, but can go almost anywhere (once you have the requisite muscles). There is also a hybrid of those, a bike that can allegedly do both, but it defies logic, so stick with one of the above. Frame. Here’s something I’ve only just discovered, about mountain bikes, they come in (at least) two types. Those that can go anywhere, and the rest that can only do level and uphill. That’s right, heard it from no less than MERIDA themselves, though I have been riding mine downhill for eight years when I shouldn’t, and so far nothing has happened. Size. This is crucial, like having a suit fitted, there is no one bike that fits all. Input your measurements here (https://www.evanscycles.com/en-es/help/bike-sizing) to discover what you need, and never rely on just being able to adjust the saddle. As a very rough guide, if you are: 4’ 10”-5 2” tall you’d need a 13-14” frame/ 5’ 2”-5’ 6” a 15-16” frame/ 5’ 6”-5’ 10” a 17-18” frame/ 5’ 10”-6’ 1” a 19-20” frame/ 6’ 1”-6’ 4” a 21-22” frame/ and 6’ 4”-6’ 6” a 23-24” frame. Also get the lightest frame you can afford, this will make all the difference, especially when you have to push the bugger uphill or with a puncture. Avoid any complex/ frivolous stuff, that will either require a high level of skill or tools to maintain/ tools/ replace worn parts. Examples of these are hydraulic disc brakes, instead of plain cable operated, and suspension forks. Tyres. This bit ought to be easy, but no. First, the back ones will wear a lot quicker than the front, this is because all your weight is on the back. I am now on my fourth back tyre, yet the front one is still the original. They also come in at least two types, performance and longevity. The only difference I can see being the first one will last you about 700kms and the latter a lot longer. I found this out the hard way by innocently buying two very highly-rated MAXXIS 2.1, and they were utter crap. Now I have CONTINENTAL MOUNTAIN KING II 2.2, and hopefully these will last. When fitting tyres note there is an arrow on them which shows which direction they should go. This is for the front only, the rear one (on mountain bikes) should be put on the other way round, apparently this gives better grip, though it will be hard to tell. Avoid unnecessary punctures by the spoke-heads, by first sticking electrical tape round the inside of the rims (two layers if necessary). Don’t skimp on inner-tubes, cheap ones will simply perish within a year, and to prove it I just had two explode on me the same day, one while the bike was sat indoors. Finally take care who you buy your tyres from. I’ve used Wiggle, who were excellent, then when they didn’t have what I wanted made the terrible mistake of using cycletyres.com. Who sent me chinese counterfeits instead of what I ordered, then refused to replace them, not a nice company, pass on the word please! Unless you are rich, and have a bike shop on the corner, owning a bike also means having to do regular self-maintenance, as much as an hour a week, especially with mountain bikes. So you are going to need: a book on how to do this (I haven’t found one yet, but avoid any US ones)/ spares (tyres/ inner-tubes/ chain/ cogs etc)/ special tools/ a space to work/ and if you have a bad back a really good bike stand (TOPEAK is the best I’ve seen, but as yet beyond my budget), to hold it in place while you work. This could all cost as much as £300. Saddle. This is crucial, especially if you are extremely thin like me. Try some out first. I prefer it to be as wide as possible, foam not gel, and with a channel all the way down the middle, for all the bony bits. So much so that this one has to be held together with elephant tape because I’ve been unable to find a replacement. Lights. Get the best you can afford (£50 is sufficient), rechargeable (mine are USB), a minimum of 40 lumens (front)/ 10 lumens (night), and easily removable when parked up in a public place. Check out LEZYNE DRIVE (http://www.lezyne.com). Security. Leave a bike virtually anywhere today (including Almonaster la Real) and it will get stolen, eventually. In a city or large town, even with an expensive lock, this will happen sooner (there are specialised gangs who know all their weak spots, come armed with the right tools, and make their escape by van). Best policy then is to take the bike with you, wherever you go, or walk. Another reason for a light frame. Helmet. Crucial. If you fall off or get hit by the door of a parked car opening suddenly, you will probably land on your head, so protect it. Same goes for hands and any other exposed area. Pump. The best type I’ve found so far is the one shown in the photo. It takes very little effort to inflate and can be used also just as easily with car tyres. This one is a TOPEAK. I also suggest having a separate digital pressure gauge, for accuracy. Tyres need to be checked at least once a week. For when you are on the road you will need a smaller version. Though when you go to use it will probably wonder why you bothered, because they are so inefficient you’ll probably have a coronary trying to get the tyre up to any workable pressure. Cheap ones certainly aren’t worth the bother. I bought a TOPEAK MINI MORPH, but it turned out to have a faulty valve and the locking mechanism was so poor it sheared right off. Total waste of money, as (with all my dealings with TOPEAK) they refused point blank to honour the warranty. Carrying stuff. You’ll want to take things with you, and of course in all weathers too, so the first thing you probably think you need, is a set of waterproof panniers (one for each side over the back wheel). Well I did. Got the SUPER TOURIST TX DISC rear-wheel frame and DryBag DX panniers (both by TOPEAK), and it was a nightmare from the very start. Instead of receiving what I ordered and paid for, the on-line seller ukbikestore.co.uk, sent just one pannier and refused a refund. Secondly, assembling it all was like anything from IKEA, a real challenge. I tried every permutation and still there was no way the bag would fit effortlessly onto the frame. The fixing lock has never worked. Within a week every single nut/ bolt (holding the bag to its frame) fell off. The reflective strips peeled off. And after only a month a hole appeared in the waterproof fabric. Basically, totally useless. Plus I discovered that anything carried in them had to be of a specific shape/ size, as well as well-insulated with bubblewrap, as the bumping up and down and protruding bolts caused incredible damage. As for carrying them, when the bike was parked up, it was really awkward and uncomfortable. What I should have gone for instead was a waterproof rucksack. Or to be more accurate, a drybag/ drysack. This is a thing I had not previously known existed, though turns out there is a surprisingly large choice of types and makes available. The first one I got was by LOMO Watersports and utilises a tarpaulin-quality pvc, with a roll-over top opening, and comes in white & black or reflective/ fluorescent yellow. By sheer luck I chose the optimum size: 30 litre. 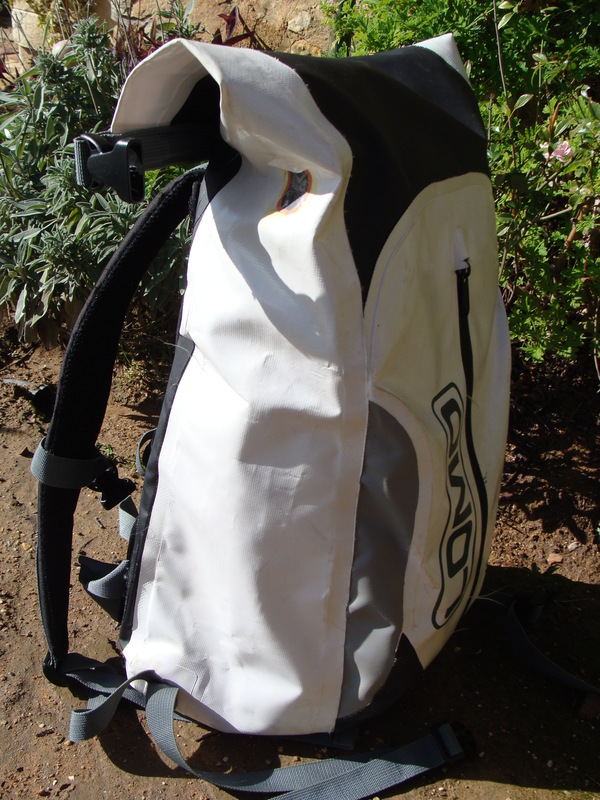 It weighs nothing and is super comfortable, carrying a 10k-20g load easily, indefinitely. What I especially like about this over the pannier is: the roll-over opening (as the zipped pocket at the front broke after a month), and the shape, it allows for all kinds of loads. It is also incredibly cheap, at around £35. That was the good news. Now the catch. Durability. I use mine daily, and after only six months the material around the roll-over top started to crack in several places, which meant it was no longer waterproof. The first time this happened LOMO kindly sent me a replacement, without any fuss (although I had to pay to return them the damaged bag for evidence), but it then happened again to the new one. This time they sent some replacement fabric to make patches (which can be done easily using the same glue as for inner tubes), but this only extended the life by another six months. After that I sought advice from my favourite Bristol bike forum and was advised to get a Gab bag. This has the same design as the LOMO but is made of a very different and far more superior material. Still super-light and just as super-comfortable. And this time slightly larger too. I am very happy now. Also brilliant for walking in cities, nothing can be accidently lost or stolen without me knowing. But it wasn’t cheap (around £90), so to make doubly sure it lasts long enough I have also got myself a cheap and cheerful ordinary day bag to use when it is definitely going to be dry and I don’t have a load to carry. It’s a BERGHAUS 24/7 30 litre. I’ve got nothing good to say about this, except it is comfortable. Unnecessary fiddly design, I’m sure the zips will die soon, difficult to get anywhere near the same amount of my usual stuff in, and of course not even shower proof. Where to buy bikes and bike stuff on-line.